Our guide said we were going to catch fireflies. We ended up drinking with a bunch of stumbling, slurring-drunk policemen. I still don't know exactly how this happened. I also don't exactly know if they were on duty or not. 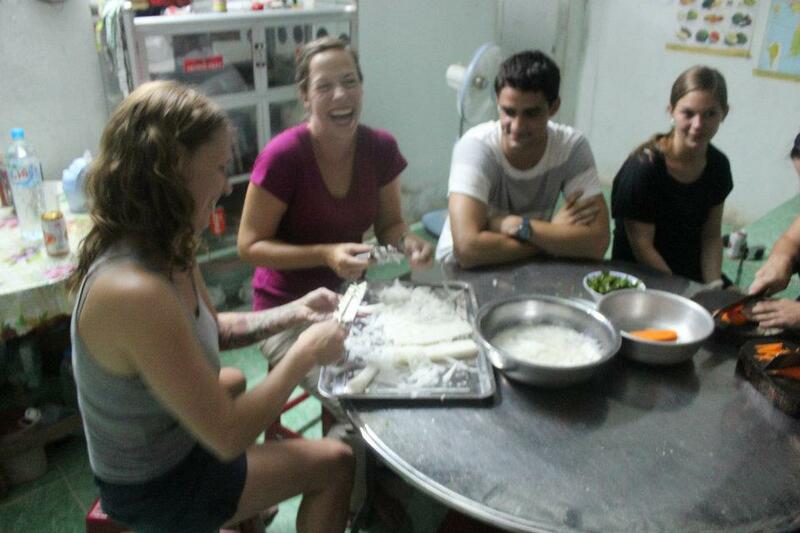 Courtney and Dan and I were in the midst of a homestay in the Mekong Delta in Vietnam. We had just finished a fantastic meal that we helped our host mother prepare. Or, most likely, she cooked it in spite of our abominable preparation activities that we tried to disguise as "help". Courtney and I found that we were quite skilled at flinging daikon onto the floor. As we were all entering blissful food coma, our guide stood up and declared, "Ok, we go catch fireflies now!" We followed our guide out into the dark. He led us down the unlit path through the fields to the ferry dock. We boarded a ferry and got off on some other island. We followed our guide yet again down a dark, unlit road. He turned abruptly into someone's yard and knocked loudly on a garage door. A man in his pajamas with a lit cigarette in his mouth flung the door open and, without a word, started to literally throw bicycles at us. When each person had a bicycle, he and our guide exchanged a couple of words, and he slammed the door shut. We all exchanged looks of utter confusion. "Ok, we go this way," our guide called back to us as he took off on his bike. We took off on our less-than-trusty steeds after him down - shocker - another completely unlit and pitch-black road. We must have ridden for 15 minutes or so in this state of utter darkness. I kept thinking that these better be the most &%$#ing amazing fireflies on the face of the earth. We finally came to a small town. There was light! I could almost see where I was going. Our guide rode up to an open area on the river where a few people were gathered around small plastic tables enjoying a few drinks. So this was it. By "catching fireflies", he meant "drinking beer". I was in no mood to drink beer. Not because of the lack of actual fireflies or the horribly sketchy transportation, but because my stomach was reeling at this point. Our infamous Champocalypse episode had occurred just the day before, and our dinner that evening, while wonderfully delicious, was laden with MSG. My stomach had enough to deal with at the moment, and beer was definitely not going to help. I elected to consume water instead. A local came stumbling over to our table and spit out some slurring Vietnamese. As soon as he figured out that Courtney spoke a bit of Vietnamese, he invited her to join him and his buddies a couple of tables away. I'm sure that the fact that she's a smoking hot blonde didn't hurt, either. She followed him to his table. A few moments later, she came back and clapped Dan on the shoulder. "They want to drink with the big American. Come join us!" Dan looked pained. His stomach was still recovering some, too. I laughed at him as he reluctantly stood up, looking like he was walking to his death. Finally, they sent Courtney back again. "They want all of us to join them. Come on, they're fine! Just... really drunk." The rest of us reluctantly joined them. We all pulled up chairs, and the men started cracking cans of beer and pouring them over large chunks of ice (a common way to drink beer in southern Vietnam because it's just so ungodly hot). They were surprised when I turned down the glass offered to me. I tried to pull out my best charades skills to tell them about my stomach's plight. Mr. Ming was the leader of the group. He was the one that initially approached Courtney. He was also the drunkest. Our guide let Courtney attempt to do all the translating while he looked on amused. We managed to muddle our way through introductions. Courtney asked the men what they did for a living. They were all policemen. And here they were, smack in the middle of the town they protect and serve, getting rip-roaring drunk for everyone to see. I got the impression that this was a frequent pastime for them. After refusing many more beers, we finally started to get up and leave. After all, we had another 15 minute ride in the dark to undertake. Mr. Ming asked Courtney for her phone number. She agreed, and as soon as she said yes, all the men whipped out their cell phones to take her number. With that, we left. We made it back without anyone crashing - and without seeing a single firefly. But that's ok, because we got something even better - a night out with Vietnam's finest Keystone Kops.